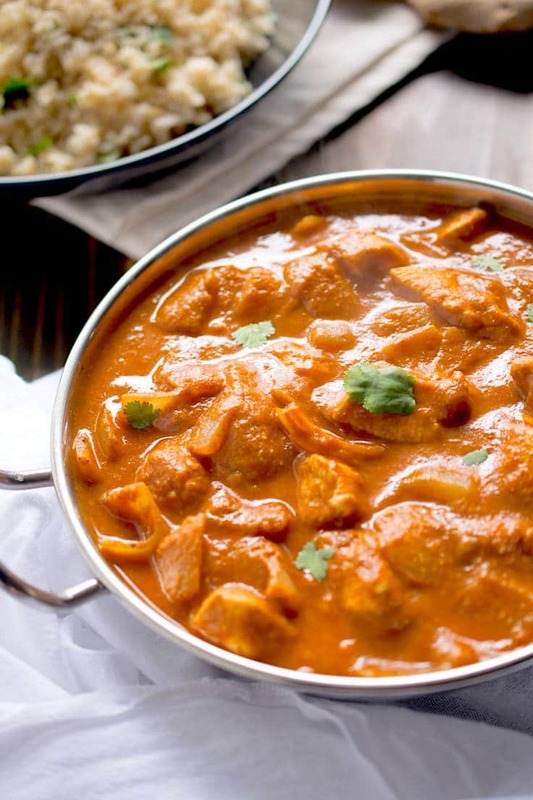 Ask any Englishman and most of us do love a good curry, but it must be an Indian curry, the most popular takeaway food in the UK. 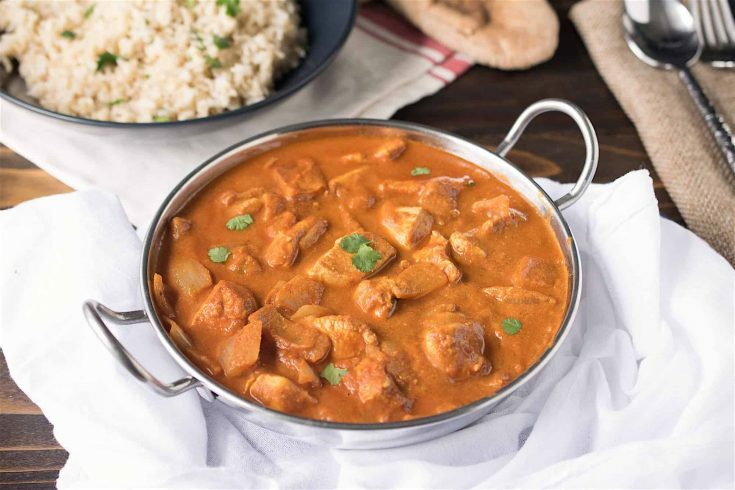 Over 200 years ago the first ‘curry house’ opened and it’s been a British food staple ever since and Indian cuisine has become a $5 billion a year industry. London has more Indian restaurants than Mumbai and Delhi! Wow. 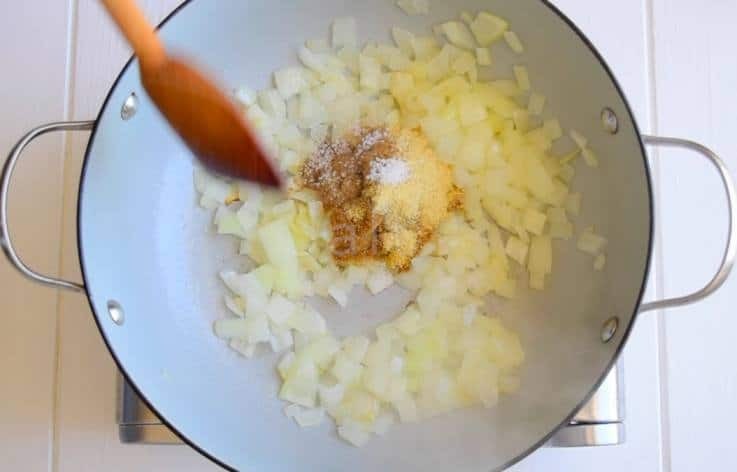 But one can’t just live on takeaway food, (well, my friends might beg to differ) because I prefer to make it myself so I know what ingredients I’m eating, so, this started my quest to find my own ‘takeaway’ recipe. Chicken tikka masala is the most popular Indian dish, but it’s not very waist friendly because it’s loaded with heavy cream. For this recipe I replaced the cream with milk and yogurt. This switch not only makes this Chicken Tikka Masala healthier, but is very easy to make and turns out delicious every time. I found my takeaway right in my own kitchen and the leftovers are even better! Chicken breasts are marinated in yogurt and Indian spices. While the chicken marinates, onions are softened in oil and cooked garlic, ginger and more Indian spices. If you like it spicier, add a pinch of cayenne, paprika or red pepper flakes. Tomato paste is added to the onions for the start of the rich tomato flavor. 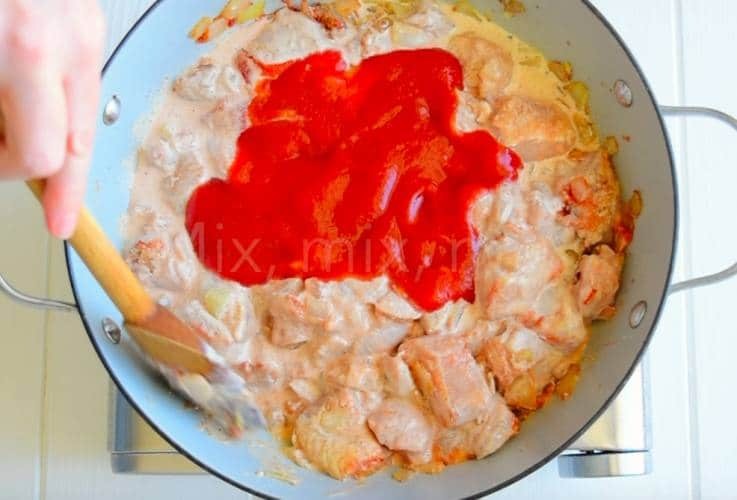 Milk, tomato sauce and the chicken is then added and simmered to tender perfection. 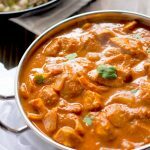 If you’ve tried this Chicken Tikka Masala or any other recipe on the blog then don’t forget to rate the recipe and let me know how you got on in the comments below. I love to hear from my readers! You can also FOLLOW ME on FACEBOOK, TWITTER, INSTAGRAM and PINTEREST to see daily recipe updates. To a large bowl add the yogurt, garam masala, coriander and 1/2 teaspoon salt, mix well. 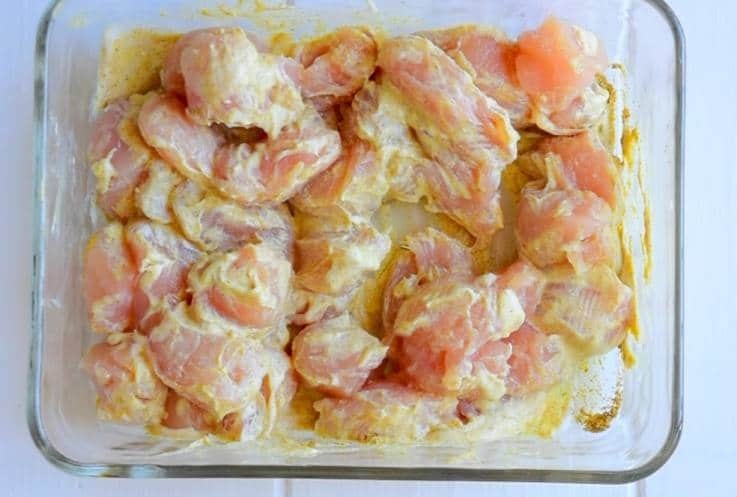 Mix in the raw chicken pieces to the yogurt, cover and refrigerate for 2 hours. After 2 hours remove from the refrigerator. To a large saucepan add the vegetable oil over medium heat. Add the grated ginger, garlic, cumin, fenugreek and 1/2 teaspoon salt. Stir the spices into the onions until well mixed and cook for 1 minute, stirring often. Stir in the tomato paste and cook for a few seconds while stirring. Add the chicken and yogurt that has been marinating, stir. Add the milk and tomato sauce, mix well. Simmer on low heat uncovered until sauce thickens and the chicken is cooked and tender, about 15 minutes. Check for salt and add more if needed. Serve over basmati rice and garnish with cilantro with a side of naan bread. This is not tomato ketchup (I know that in UK & Australia sauce is what you call ketchup). This is pureed tinned tomatoes with no herbs or spices added. I love this recipe and make it regularly. It’s great for a dinner party because it can be made in advance. My family loves it. It is consistently delicious every time I make it!! My husband is British and has high standards for Indian food! This is so nice to hear, thank you. Granted that I used Madras Curry Powder in place of Garam Masala, this did not taste remotely how I wanted it to. The tomato flavor was way too strong and acidic, and didn’t taste anything like my local Indian restaurant makes it. I don’t like my food spicy, so that wasn’t my issue. It just seemed off on all levels. The combination of spices that I suggest is a proven formula and if you use any other I cannot guarantee the flavor outcome. If you try the recipe again using the spices in the recipe, you’ll see that it is much better. Love love this recipe! Cook it at least once a week! Closest recipe to the real thing that I’ve found. Yummy! I guess your recipes are not that spicy and therefore not authentic Indian. I added heavy cream and extra yogurt. The tomato paste is not necessary since it gives a strong tomato flavor and I would then have to add a tsp of sugar to cut it. I also doubled all the spices and added Kashmiri red cayenne pepper, red pepper flakes (1/2 tsp), extra garem masala, black pepper. I used vegetable oil and ghee mixed and fried the chicken pieces to golden brown. I then added it to the curry and let it simmer for 1/2 hour and then added a lot of green coriander (cilentro). Nowadays even Indian restaurants in the US do not make their dishes hot and spicy. A shame. Otherwise, your basic recipe is good. I believe the original recipe calls for grilling the chicken in strips and then cutting them into pieces before adding to the curry. That’s extra work that I feel is not needed. I do not claim that my recipe is authentic, I am British and this is how I’ve always made it. I always give choices to my readers as to the spice level they prefer and they can adjust accordingly to their taste. I agree that the extra work of grilling the chicken is not needed. This is one of my post popular recipes and I welcome your comment and suggestions. Thanks for visiting and I’m happy you made it to your liking. This has become a staple in my family’s dinner menu. We usually make jasmine rice and heat up a bag of peas and then place the tikka masala on top. I did mine over a bed of quinoa with a side of roasted broccoli. It was delicious. Keeper recipe. What a delicious, healthy idea. I need to try this. Thanks for stopping by. Lamb is very popular in Indian cuisine so it will work really well. This cooking on the stove right now. It smells so good! I can’t eat dairy so I substituted almond yogurt and coconut cream. Thank you for the great feedback. I’m so glad you were able to adapt it to your dietary needs and hope you enjoyed it. Made this to satisfy a pregnancy craving (I had it bad!). I made too much, do you think this could freeze well? Aww, this is lovely Debby and made my day. Thank you so much for sharing and following. I made this last night and I’ll never get Indian takeout again. Thank you for the best recipe ever! Hi I just tried the recipe. I think I used the wrong tomato sauce. I didn’t know there were different kinds of tomato sauce. I had a hunts tomato sauce that had spices added and a Goya tomato sauce. I used the Goya but it doesn’t quite taste as authentic as I hoped. What kind of tomato sauce do you use? Hello Maryam, I use a good quality like Hunts or Pomi sauce, but it is important to check the ingredients to make sure that there are no other ingredients in there like herbs, spices or garlic or it will drastically change the recipe. Goya do tend to add ingredients to their tomato sauce so if you can find a different brand that would help. 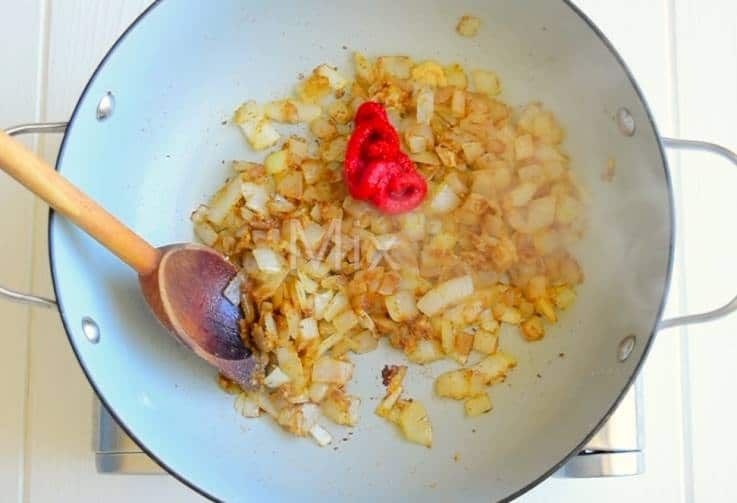 You can also use crushed tomatoes or diced tomatoes that will add a little texture to the sauce, but you do just want just tomatoes, nothing else. I hope you make it again because it really is a good dish and is one of my most popular recipes. Hi Janette we also love our curries, and am very keen to try your Chicken Tikka Masala. In Australia tomato sauce is not sold in cans and I am wondering would this be the equivalent of our tomato purée in a can or is it the same as tomato sauce in a bottle (the sauce you would pour over a sausage sandwich)? Hi Gail, I would not use the tomato sauce you mentioned, you need pure tomato sauce with no flavorings added so the puree will work perfectly fine. I hope you like the recipe. Hello, I absolutely love chicken tikka masala. When I go to my favorite Indian restautant, the sauce is so delicious, but the chicken is chopped in huge chunks, and they use dark meat. I prefer lean chicken breast cut in small pieces. I plan to make this tomorrow. If this recipe needs more spicy hot flavor, can I add cayenne? I am really excited ti make this recipe. Hi Susan, that is what I love about making my own is that I can make it how I want it and now so can you. I think you could add cayenne to increase the spice, just taste as you add. I hope you like it and thanks for stopping by. Hi Janet, I’m so glad you liked it. I use a 400 gram tin of tomato sauce, which is the equivalent to the 14 ounce tin that are in the recipe. I hope this helps. Hi thanks very much!! I didn’t use that much so will give it another go!! Thanks for replying. Hi! I am looking forward to making this this weekend as I love the dish but hate the typical heavy cream. I did have a spice question. I happen to have a Shan pack of “meat masala” mix. I read the ingredients and it contain “fenugreek” – would this be sufficient? Hi Tonya, I’m not familiar with this mix but if it has other spices and flavors, the dish will not taste the same. Hi, my husband and I just tried Tikka Masala for the first time last night and fell in love! I was excited to find your recipe on pinterest, can you recommend a good brand of garam masala? I’ve never purchased it before. Thanks! Hello Cammie, I am finding that my local grocery stores carry garam masala in the spice aisle and right now I have McCormicks, but I have tried other brands and they are all good. It should be pretty easy for you to find. I want to make this this weekend and I am wondering what type of milk to use. I have almond milk or canned fullfat coconut milk? Thank you so much for your feedback Sarah. I must try using mustard seed. I made this last night for dinner. I am absolutely in love with this dish. I didn’t have time to marinate the meat for 2 hrs as instructed, it was more like 20 minutes but still came out delicious! The whole family, including the children, age 7 and 9, devoured this….and this type of food is not a normal in our house!!!!! Will definitely be making many times again in the future. Thank you for posting!!!!!! Just wondering the estimate on Calories for the curry? I loveeee Indian food but we recently started calorie counting! Hi Rebecca, I don’t have the exact calorie count, but I would say this is about as low calorie as you could make it and a serving is probably no more than 200 calories since there’s not really ingredient that is highly caloric (that is without rice) Just make sure you buy the ingredients that do have the lowest calories. I hope this helps. Do you cook the chicken beforehand or put it raw into the yogurt? hi janette – any suggestions for adapting this for a slow cooker? Hello Mary, great question. Because you are basically boiling the sauce, it is safe to use the yogurt marinade. I hope you enjoy the dish. Hi Kathy, I do mention that I have lightened up the recipe without cream, but it does not lack in flavor as all the comments will attest to. I also do not claim to be Indian so if you are looking for real style, there are many recipes out there that will appeal to what you’re looking for. Thank you for stopping by. I just wanted to commend you for your well stated, yet gracious reply to that post. And thank you for adapting a dish to make it a bit more health conscious, while still keeping the flavor & heart of the dish. I will definitely be trying it. I love chicken tikka masala. The flavor was delicious but the sauce never thickened, what did I do wrong? Hello Brenda. I’m glad you liked the flavor. The lack of thickening can sometimes come from the tomatoes if they have extra liquid. What I have done in this case is simmer longer and allow some of the liquid to reduce. If this doesn’t work, mix a little corn starch with cold water and stir into the sauce as it cooks uncovered. I hope this helps and hope you make it again. I tried this tonight and, while it smelled delicious, it turned out rather bland. Any suggestions? Hello Bri With all the flavorful spices used, I’m not sure how it could have been bland. I make this myself about every 2 weeks and it’s comes out flavorful every time as well as many of my readers. Because I’m not in the kitchen with you when you make it I’m not really sure what could be wrong. Do you have all the measurements correct? Are you using all the suggested spices? Did you allow it to cook for the 15 minutes? This helps develop the flavors. Can I use fenugreek seeds ground up? All I can find at my specialty store is fenugreek seed. Is it the same thing? I can grind it up if so. Yes, grinding the fenugreek seeds is perfect. You will get great flavor. I hope you enjoy the recipe Andrea. Hi Kathryn, I have used both and I found that regular yogurt works best because Greek tends to make the sauce grainy. I hope you enjoy it. We have ground fenugreek from a Middle Eastern market. But we also just got some fenugreek leaves online from World Spice Market in San Francisco. They have the most amazing and varied line of products at super reasonable prices. I am fairly certain they have ground fenugreek as well. That’s where I get garam masala and curry blends as well. Thank you for the feedback Kathleen. I’m glad you were able to make it work and stay in from the snow. It sounds delicious. Hi Nicole, yes Greek is fine. Any plain yogurt will work. I hope you like it and thank you for stopping by. I was wondering if the chicken could marinate overnight? Thanks for the recipe, we’re so excited to try it! Hi Susan, absolutely. It will be just that more flavorful. Thank you for stopping by. What is fenugreek and can something be substituted for it. Thanks. Looks delicious. Hi Val, fenugreek is a spice that is usually not found in many supermarkets. You could substitute equal amounts of mustard and fennel powder, or use mild curry powder. I hope this helps and thank you for stopping by. Delicious recipe, and so easy, thank you!! First time made we used “fake” chicken (vegetarian), and tarragon as a desperate substitute for the fenugreek. It was good, but your recipe is better! Thank you so much for your feedback Lena. I’m glad you enjoyed it. I am thinking I will make this this week and am wondering where you found ground fenugreek? I have fenugreek pills I have taken in the past and it seems strange to me that it would be the same thing? I hope you do make it Rebecca, it’s my favorite Indian dish and comes out great every time. I buy fenugreek at my local Indian market, but if you don’t have one close to you maybe there’s a spice store close or if all else fails you could order online. Hope this helps and thank you for visiting. I made this yesterday and I am in love! Thank you. I have tried many recipes and this by far is my favorite! Love the flavors of this dish. Looks awesome. It may be wrong, but I am jealous of anyone who can put something like this together and make it look so appetizingly beautiful; great job Janette! This looks amazing – it couldn’t look any more delicious! Thanks for sharing this recipe! This chicken tikka masala looks amazing! NZ is the same as far as curries go. We LOVE them! This looks amazing Janette! 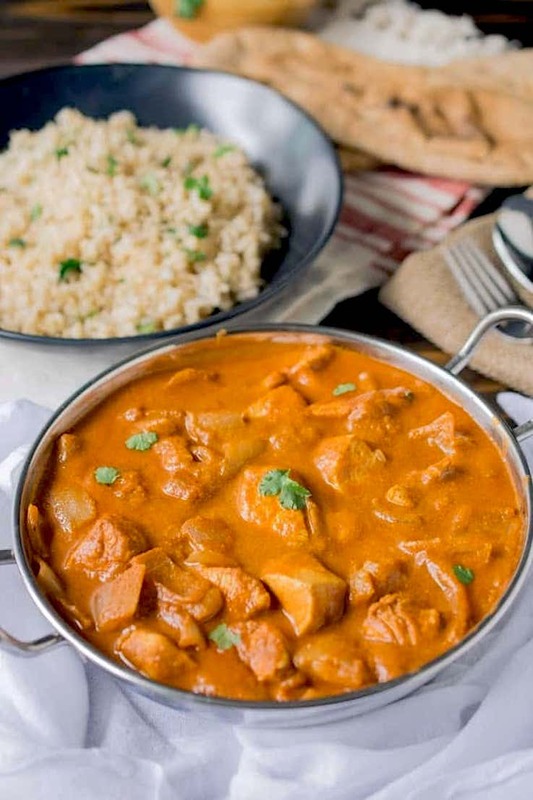 I love Asian recipes – and chicken tikka masala is a favorite Indian dish! This recipe is so perfect, I am thinking of adapting it into a vegetarian version (Paneer Tikka Masala). Just curious why you used Yogurt instead of heavy cream? To keep it on the healthier side, I assume? Your recipe is exactly like the way they serve it at Indian Restaurants. Hi Rini, yes I used the yogurt just to lighten up the recipe. Paneer version would be so good.